On an archipelago off British Columbia, wildlife may have hidden from the past two ice ages. For decades, geologists and biologists have debated whether parts of Haida Gwaii, a remote archipelago off British Columbia’s central coast, remained ice-free throughout the most recent ice age, which encased much of Canada in thick ice until roughly 11,000 years ago. During that time, many plants and animals were driven out—or driven extinct. But on Haida Gwaii, they may have found refuge from the ice. Now, a recent study adds new evidence to that debate, suggesting that parts of Haida Gwaii may have remained ice-free not only during the last ice age, but also in the one that came before. Since Haida Gwaii (formerly known as the Queen Charlotte Islands) is home to a host of unique local plants and animals that appear too distinct to have evolved since the ice receded, biologists argue that sections of the islands must have escaped the ice, and served as a last bastion for wildlife hiding from the encroaching ice. Geologists, working with different evidence, came to the opposite conclusion. “The geologists have always argued it’s indisputable that the Charlottes were glaciated … and the botanists have said, well, that’s not possible, because you have these disjunct animals and plants,” says John Clague, a geologist who has been investigating the question since the early 1980s. “[It’s like] you’re playing cards with a deck of 52 and you only have one or two” in hand, says Clague. Geologists and biologists are looking at different cards, and trying to make sense of them. “[We’re] very good at coming up with stories, and the stories have to make sense, but it doesn’t mean they’re right,” he says. To help reconcile the differences between the disciplines, Clague has teamed up with his colleague, biologist Rolf Mathewes, to look for new evidence—to overturn new cards. Until recently, the debate over the presence of ice-age defying refugia on Haida Gwaii has been focused on the most recent ice age—from roughly 30,000 to 11,000 years ago—largely because radiocarbon dating, the predominant technique for this kind of paleoclimate research, doesn’t work for samples that are more than 50,000 years old. But by using a new technique called optical dating, the researchers were able to push their investigation further into the past, all the way back to the second-to-last ice age around 57,000 years ago. In a new study, Mathewes and Clague, along with colleagues Olav Lian and Matthew Huntley, present the results of their investigation of Haida Gwaii’s penultimate ice age. Their evidence supports the biologists’ interpretation that plants and animals had found an ice-free refuge on Haida Gwaii. By analyzing spores, pollen, and sand grains from the sea cliffs in northeastern Haida Gwaii, the researchers found evidence of an ancient riverbed where large grazing animals congregated approximately 57,000 years ago. The sediment in the area suggests there was ice nearby, but that it stopped short of the site. “This was a cold, largely treeless tundra environment. That’s what the pollen was telling us,” says Mathewes. In particular, the team found evidence of Calder’s lovage, a plant that seems to have survived on Haida Gwaii through at least the past two ice ages. But the more surprising finding, says Mathewes, was the presence of dung-loving fungal spores at the research site. These spores grow in the dung of large grazing animals like bison, cattle, and woolly mammoths. Based on the abundance of these fungal spores, Mathewes says that the site was likely a popular watering hole for large mammals. The researchers are still looking for concrete evidence to corroborate the idea that at least some part of Haida Gwaii has remained continuously ice-free throughout the past two ice ages. But there are a lot of cards yet to be turned over. Maybe one day scientists will be able to tell the full story, but for now it seems like the biologists are winning the debate. Pauline Holdsworth is a Vancouver-based journalist who has reported for CBC Radio, The Globe and Mail, The Tyee, Megaphone Magazine, and Hakai Magazine. 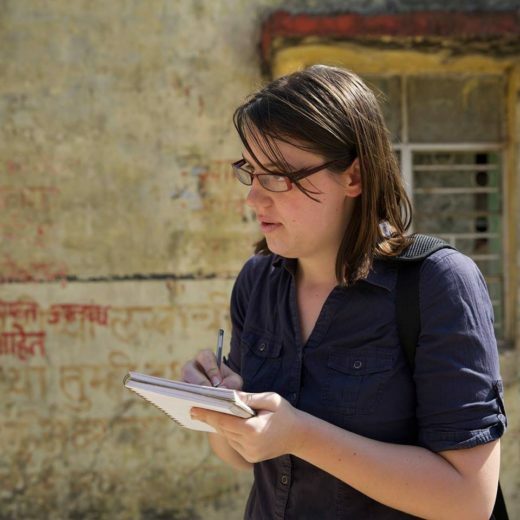 She recently completed a Master’s degree in journalism at the University of British Columbia, where her research focused on the downstream impacts of retreating glaciers and mental health in the developing world. Cite this Article: Pauline Holdsworth “Hiding From the Deep Freeze,” Hakai Magazine, Jan 6, 2016, accessed April 21st, 2019, https://www.hakaimagazine.com/news/hiding-deep-freeze/.